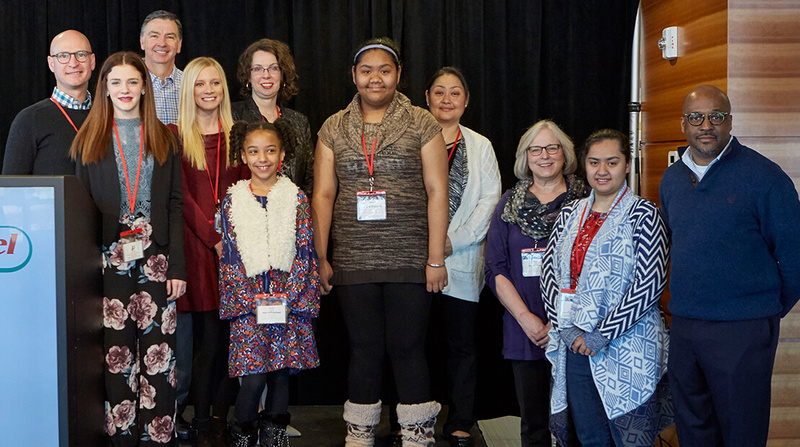 Three winners of the seventh annual Hormel Foods MLK essay contest visited the Hormel Foods corporate offices today, February 27, at 7:30 a.m., to read their winning essays. The students – Cooper Dorsey from Arkansas, Amanda Rodriguez and Mya Hollingshead, both from Minnesota – claimed the top honors from more than 500 submissions this year. Their visit to the corporate office marks the first time the company has invited essay winners in for a reading. “We are proud to continue this contest for the seventh straight year and to help children across the country learn, interpret and personalize the messages of Dr. King and what it means to them. There are five winning essays chosen from each school, and today, three of our top-prize winning students will read their essays in front of our employees in Austin. ” said Antoine Destin, HAARG president emeritus. The competition promotes the value and importance of cultural differences and provides a platform for celebrating diversity. The goals of the program are to promote Dr. Martin Luther King’s legacy, encourage children to aim high, give them exposure to minority professionals in corporate America and to create a lasting partnership between Hormel Foods and local schools. Elementary schools across the country are invited to join the competition. Since the competition’s debut in 2011, participating schools have increased from four to more than two dozen in 2018.